When you mention sharks, most picture in their mind a killing machine. 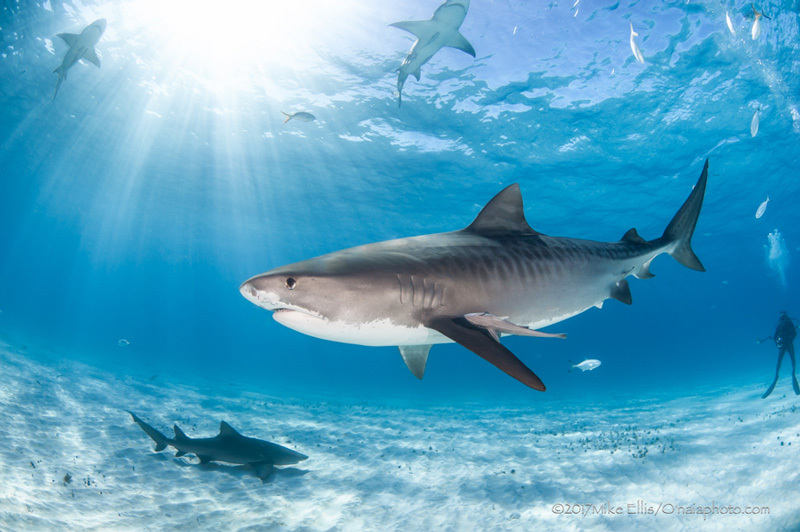 To photograph and portray the beauty of these apex predators has its own obstacles and rewards. I feel the challenges are worth it as a way to make people aware, and to care about what is more scary... their startling rate of extinction. When I started working on a charter vessel that specialized in catering to photographers who wanted cageless (a.k.a. “the lunchbox”, we’d joke) encounters, the first challenge was attracting the sharks and having them stick around for a week. 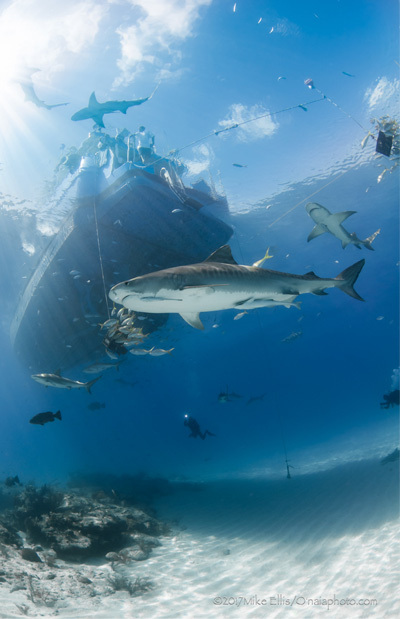 Back 10 or 15 years ago there was just a small group of boats heading to the Little Bahamas Bank to do this type of charter and we had about a 75% success rate getting large sharks to show up. Now over the last 10 years, we have changed that rate to nearly 100% with the increase in the amount of boats, the frequent chumming and of lately (more so in the last 5 years) hand feeding. 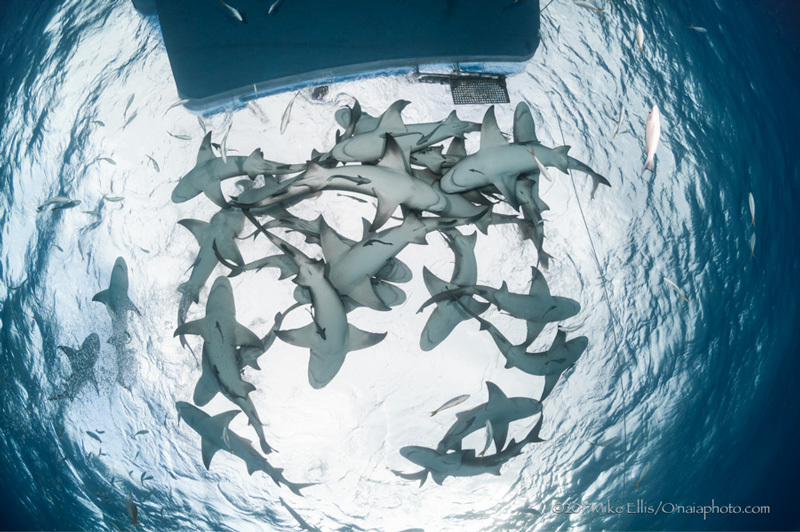 It’s not uncommon these days to have 5 or 6 species of sharks on a trip. Three of them being apex predators (Bulls, Tigers and Great hammerheads) and that can make for some incredible mixed species captures. The rewards are repeated sightings of some of our favorite sharks week after week, longer encounters and larger numbers of sharks in this beautiful patch of ocean. 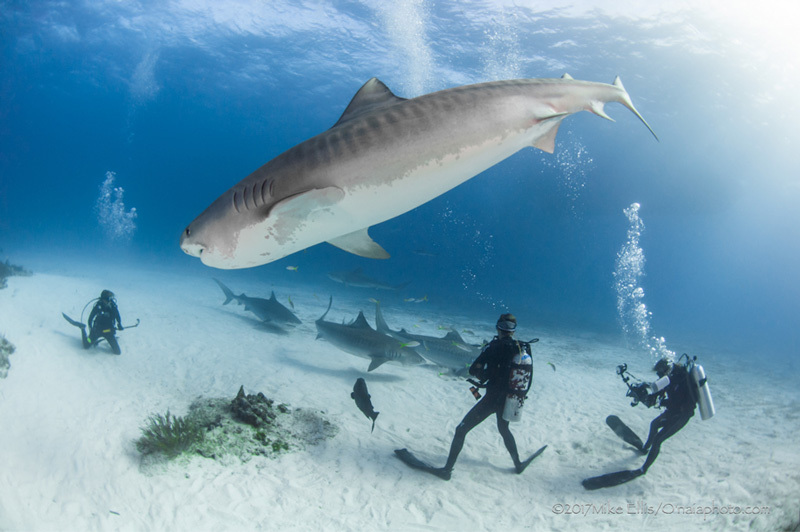 Diving and photographing sharks, large and small, can be great fun and can be made better by using some imagination and some already in and/or on the water props. If you are in shallow water with a sandy bottom, use the sand as a giant reflector and dial down your strobe output to help in continuous shooting. It will really lighten up the lighter underside of the shark without washing out the shark's shadow. Look to add interest, as in getting the dive boat in the background or the addition of the human element in the photo. 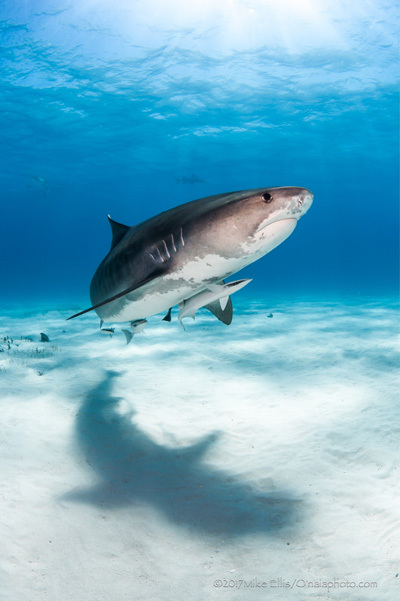 Look up and see what is going on above your head and look down to see if there are contrasting ripples in the sand that will help the shark stand out. 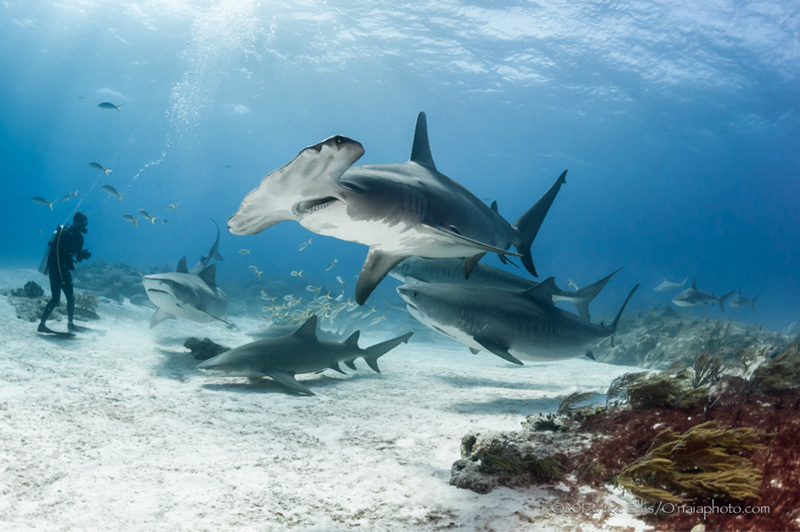 Watch if the sharks are swimming over the reef or turtle grass to help plan your next shot. Find what works for you on that day and time and how to best convey the true nature of these magnificent creatures and not the hyped up Hollywood image. If the weather turns bad, if the expected sharks don’t show or if you left that favorite lens at home, look at it as an opportunity to try new things. I cannot tell you how many “pea soup green” days in the water there have been where I had a level of disappointment to overcome. Guests would be highly disappointed as well, at least until I’d show them a good capture I was able to pull off in bad conditions. Then they would be inspired to jump back in or experiment shooting from the back deck with over-under shots. Lose the strobes on bad viz days as it leads to a lot of unwanted backscatter. 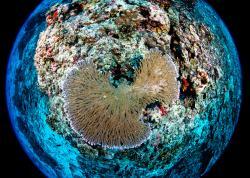 If you don’t have your fisheye lens, don’t be afraid to use a wide or macro lens instead. I found that the 12-24mm Nikkor tends to give a softer image, but if I used an f-stop of 14 or higher, stayed close to the subject and away from the zoom it worked better to produce a sharper image. I have also used a 60mm macro and got some interesting shots. My photo teacher in high school had a full length banner across the blackboard that stated “RELAX”. That’s what you should do when you enter the water: relax and observe. Look at your subjects and see how they are behaving with you and with the other sharks in the water. Or their behavior with bait in the water. Look at which direction the sun is shining from. 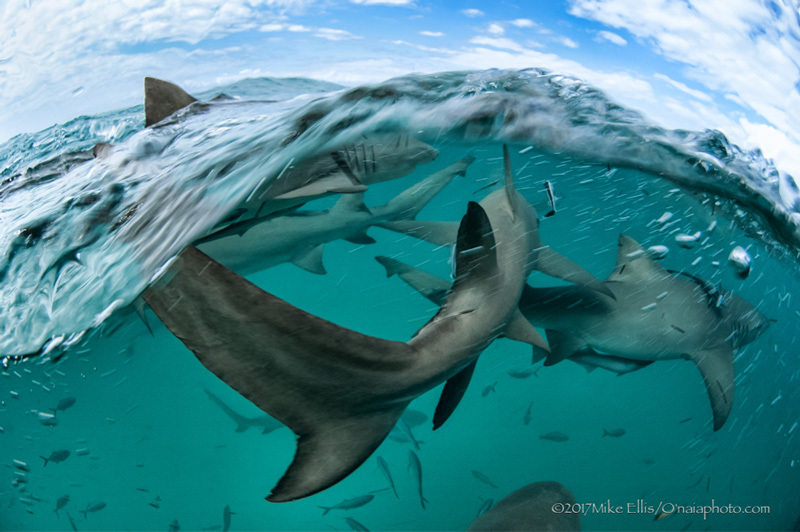 Sharks that swim up into a chum slicked current can set up a great shot. Pay attention to their different postures of arched backs and protruding pectoral fins. Observe, relax and keep things natural as possible to get the best experience they can offer you in their environment, their home. Continually look in all directions to find your best shot. That’s the best way to make it happen. Blend in, make yourself at home and don’t draw to much attention to yourself. 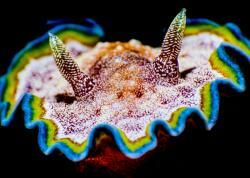 Try to learn as much as you can about your subjects, dive operator, location and underwater environment as possible. 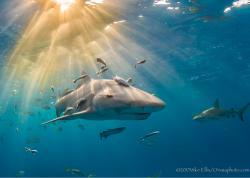 I have been on and worked on a lot of dedicated shark trips. Sometimes I knew beforehand that the weather was going to be undiveable due to high winds and large swells. 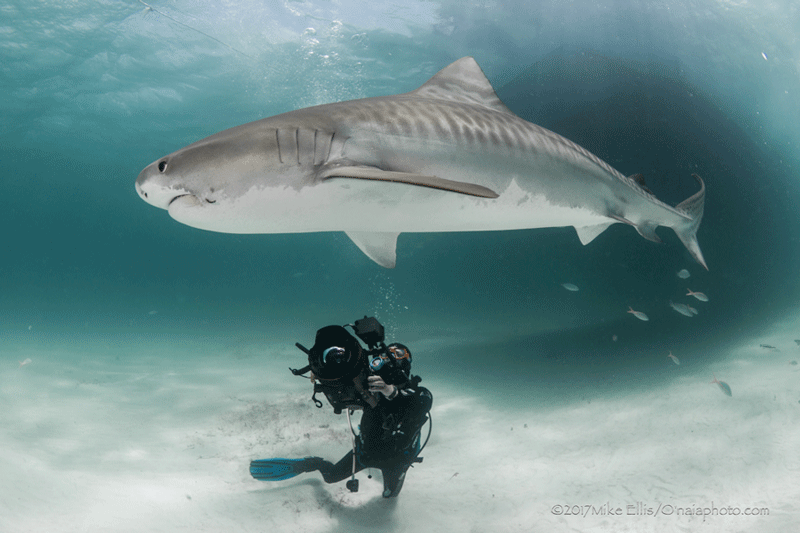 Do use good judgment on diving in unsafe conditions with large predatory animals. Remember that they rely on surprise and that diving in low to no vis means they have the added advantage. This is their realm and their eyesight and sensors are well adapted for it. Also remember to make eye contact to establish that you are aware of their presence. I have learned that some research can go a long way. Try to find out if there is a certain time of year that attracts more or different types of sharks. Is there a certain color of water you are looking for like clear shallow turquoise blue or a bottomless deep blue? Increase your chances for success by choosing a week long live aboard or a shore base operation that offers multiple days to a few different sites. Connect with other photographers/divers that share your passion and enjoy one another's tips and ideas on how/what to shoot. Make sure the Capt. and boat have the necessary experience, license and safety equipment aboard. Make sure also, that you to are up for the task and are a competent diver that has the safe skill set to undertake this new photo adventure. Remember to RELAX, have fun and to take in all that is happening around you. Mike Ellis: Sharing bottom time with some of the smartest & friendliest in the ocean to some of the largest & most feared (by some), has given me unique opportunities to photograph the popular, playful Atlantic Spotted Dolphin, to the less popular, agile Tiger Shark & much more. 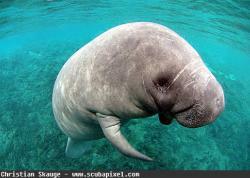 It has also strengthened my compassion towards them & the vital roll they play in the delicate balance of the oceans. It is my hope to convey this thru my photography. That people will look upon my images & share my concerns of acts of greed & inhumanness that bring many to their plight. And also to feel the heart n' souls of the ocean & how we all need each other. "For the oceans!"